This bright orange mash will add colour to the plate and help to soak up all the flavours of the Christmas gravy. Place the carrots and sweet potato in a saucepan and cover with cold water. Bring to the boil then simmer for 10 minutes, or until both the sweet potato and carrots are tender. Drain thoroughly, return to the heat for about 1 minute, then mash until smooth. Add a knob of butter and season to taste. 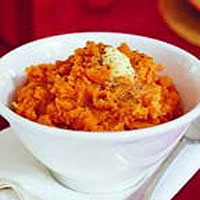 As a shortcut, replace the carrot and sweet potato mash with 2 x 500g packs Chantenay carrots. Simply top and tail them the night before and keep covered with cold water.